As a grower of quality vegetables, I am always being amazed by the magic of soil. It absorbs and holds excess water; and then releases it when there is a shortage. It holds an assortment of minerals deep within its microscopic fissures so that nutrients cannot be leached away; yet these nutrients remain accessible by fungi mycelium. It maintains a porous structure so that fresh air (O2 and CO2) can move through it. And most importantly, it is teaming with life that keeps all this magic in fine balance. All these functions may be too small and dark to see, but nevertheless it is there to serve us. Leonardo da Vinci observed that we know more about the cosmos above our heads than we know about all the activity in the soil below our feet. We still know too little about our soil, but we must start appreciating how valuable and fragile it is. A century of extractive farming practices has resulted in the loss of over half of our Canadian topsoil (from Soil at Risk published by the Senate of Canada). What is left has lost over half of its all-important organic matter. (This is carbon that has escaped into the atmosphere to contribute a third of the climate-changing CO2). 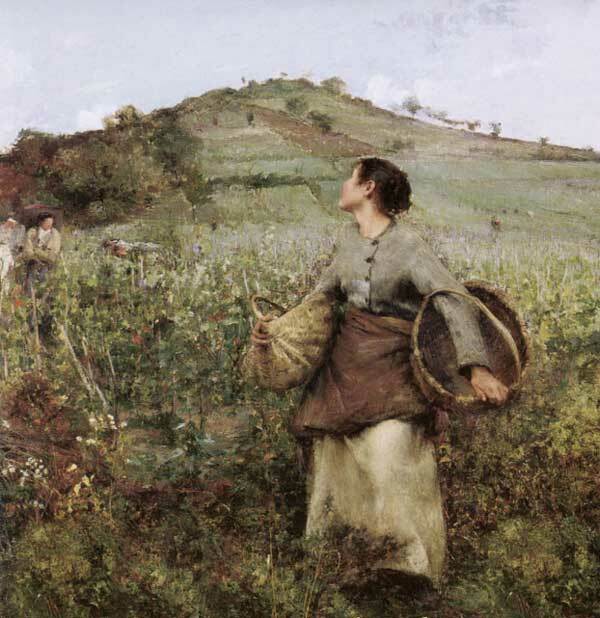 Poor farming practices are not a recent phenomenon. Egypt was once the lush breadbasket of the Roman Empire until unsustainable farming practices turned it into permanent desert. Cultures rise on quality soil; they decline when the soil degenerates. Soil is the foundation of agriculture and economies; Healthy soil is the foundation of terroir and culture. Gord Miller, the Environmental Commissioner of Ontario, has requested the government to institute a process for identifying the province’s innovators in soil health and determine the key factors in their success. He also requested that more detailed and effective educational material be worked into the Canada-Ontario Environmental Farm Plan and into the Best Management Practices publications and workshops. Ministry of Agriculture officials agreed with the Commissioner on the importance of building soil biology. So they will now follow developments in other jurisdictions. But why won’t the Ministry identify (and maybe reward) the innovators who have been working so diligently at learning how to successfully build soil biology in Ontario soils? 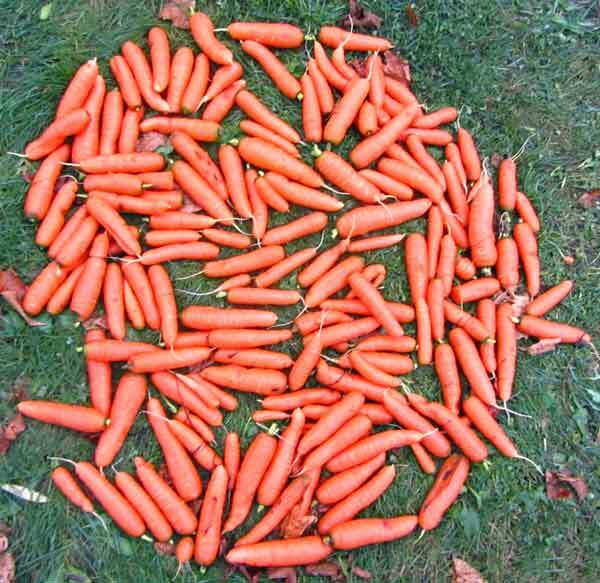 Carrots harvested from one of the 56 research plots. Farmers because they reduce pests, and extend storage life. Dalhousie transferred this grant to the University of Guelph, which then transferred the growing of these crops to me (because I suggested doing this research). Eight repetitions of seven different treatments of carrots were grown last summer. They were harvested in November. This January, with the help of Harris Ivans, I have been measuring their Total Yields, Salable Yields, °Brix, °Diffusion, Specific Gravity, pH, E.C. NO3, free Ca, and (when the time comes) their shelf-life. In February they will move on to the University of Guelph for the more high-tech measurements of carotenoids and bioactive phytochemical falcarinol. Samples will be fed to mice to evaluate immunological health effects. A trained tasting panel will determine differences in flavour profiles. And samples will be measured for their wet chemistry nutrient density. There is more analysis that could be done. But our Federal government (once again) reduced the scientific funding. If you are aware of private funding that might be willing to help complete this important work, I will forward this the appropriate university departments. There will be many thanks. One of Ontario’s finest farm mentors has a 5-acre plot ready for a market garden. Martin de Groot operates Mapleton’s Organic Dairy (best known for superlative ice cream). 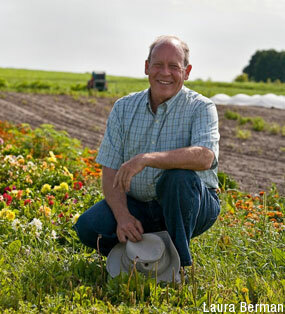 He sets aside a fine garden plot to allow new farmers to try out their own management skills for a few years prior to investing in their own land. All the facilities including a cultivating tractor, a small greenhouse, refrigerated storage, and access to the on-farm store are included. Just north of Guelph there are 600-acres of diverse organic enterprises on the Ignatius Jesuit Centre Farm. They currently have three (4-7 acre) sites available for production, research or education activities. This is a very accessible location with many supports. If you are a farmer who sets prices based on what supermarkets charge for their cheap imports, please check again! Prices of meat and vegies are continuing to rise faster than ever (another 3-5% expected this year). This is a result of the decline in the Canadian dollar, worldwide weather extremes, increasing inflation, and reductions in foreign government farm supports. A far more rewarding way to determine fair prices is to analyze your own Costs of Production. This starts with a list of the typical times to complete each step of production for each crop. I can summarize all this into a sophisticated yet easy to maintain spreadsheet that makes it obvious which products are supporting your farm business; and which ones are impairing it. I can then share tips on how to assure customers that your products have additional values that warrant higher prices. Knowing your Costs of Production is so important for keeping our farmers in business that out federal and provincial governments are eager to share 50% of the costs. I can help you take advantage of this opportunity. It is not often that we ever consider thanking our governments for something. Now there is something to be very thankful for! The Ontario Government has proposed regulations to reduce the use of harmful neonicotinoid-treated seeds by 80%. Ontario is the first North American jurisdiction to do this. Immediately after this announcement, the big guns of commercial agriculture immediately started mobilizing to defeat this proposal. Please support the bees by letting the government know you support this courageous initiative. In May 2014 the State of Vermont passed the nation’s first no-strings-attached GMO labeling law because citizens overwhelmingly want to know what is in their food. One month later the Grocery Manufacturers Association (supported by Monsanto) filed suit against the State of Vermont. Oral arguments opened on January 7th. I do not see what the GMA can possibly expect to win other than a huge loss of Good Will. It seems as though Fall Food Fundraisers have become passé; now Winter Food Fundraisers are de rigueur. Charities that support sustainable agriculture (such as FarmStart, Sustain Ontario, Ecological Farmers of Ontario, Farms at Work, Just Food, Local Food People, and Organic Council of Ontario) are struggling these days, as there is very little government and foundation support for local, ecological agriculture. What funding there is only supports new programs; it does not contribute to any operating costs. These organizations need core support to be able to continue their important work. Any donations are greatly appreciated and will be well used! The season starts with the FarmStart Harvest Table, a five-course dinner featuring a FarmStart farmer’s Cornish Cross chickens. It is $100 on January 29 at Artisanal French Country Cooking in Guelph. In support of Community Food Centres Canada there will be four meals during January and February that will be prepared by acclaimed Chefs for Change at Toronto’s Propeller Coffee Roastery for $75 each. The largest event is Recipe for Change in support of FoodShare. To be held on February 26 at the Toronto St. Lawrence North Market, it will feature food from 30 chefs for $150. The season actually started early in December with a very fine series of workshops organized by Ecological Farmers of Ontario. Being held in the remote rustic setting of YMCA Geneva Park, it provided terrific opportunities for farmer-to-farmer discussions. Soon after the Guelph Conference is the Green Belt Foundation’s Local Food Symposium on February 5th in Niagara on the Lake. There will be many well-known speakers with an emphasis on ways to market more significant quantities of local foods through Food Hubs, the Public Sector and Food Processing customers. At Wilfrid Laurier University in Waterloo on February 17th is a fascinating symposium on Sustainable Fertilization Technologies. There will be discussions on the mechanisms involved in making nutrients available to plants by using the diversity of microorganisms present in soil and soil amendments. And then on February 18 and 19 back in Niagara on the Lake is the 13th annual Ontario Fruit & Vegetable Conference. There are a variety of half-day series of workshops on such topics as: soil fertility, organic weed control, marketing at farmers’ markets, specialty crops (including hazelnuts and chestnuts), spotted wing drosophila (a new pest from Asia), and just about every fruit and berry. On Wednesday afternoon there are craft beer and cider competitions. In Toronto on February 21st is the always-insightful not-to-be-missed Canadian Organic Growers Toronto conference. This year’s keynote will be by the leading soil biology expert, Elaine Ingham. Continuing with the theme of soil will be David Montgomery, author of Dirt: The Erosion of Civilizations. And then, returning by popular demand is Dr. Thierry Vrain. With his understated style he will share recent alarms about the side-effects of the increasingly rampant use of Glyphosate (Roundup™). The 35th annual Eco Farm Day is a more intimate Eastern Ontario farmer oriented conference and trade show. This will be held in Cornwall on February 28th. There will be workshops on pastured poultry, dairy, pork, beekeeping, seed production, open pollinated corn, precision farming, small-scale organic certification, root cellars, medicinal herbs, and Holistic Management. It is always a treat to hear valuable experiences shared by local farmers and researchers.